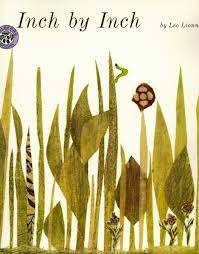 This month’s Virtual Book Club for Kids featured author is Leo Lionni. We chose the book Inch by Inch to showcase. In the story, a robin and inch worm encounter one another. The quick thinking inch worm convinces the bird to allow him to measure her tail to avoid being eaten. The inch worm then travels around measuring different birds until finally he inches his way to freedom when he measures the last bird’s song. The book has great math (measuring) extension possibilities. 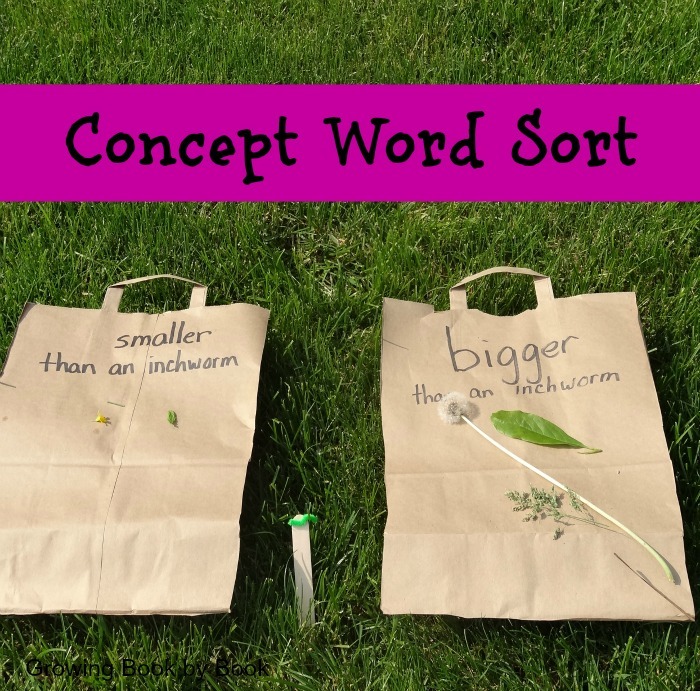 To also tie in a literacy extension, we came up with a way to work on two concept words- smaller and larger. First, we created an inch worm out of a green pipe cleaner and attached it to a popsicle stick. Then, we took two paper grocery bags and labeled one “smaller than inch worm” and the other “larger than an inch worm”. Place each bag outside in a designated area. My little one was then ready to take his inch worm and begin his hunt around the yard for things to place on each bag. Each time he found an item, we talked about which bag the found item should be placed on and the reasoning behind the placement. This was a simple and fun way for us to work on two concept words and develop language to explain our reasoning. I can see us repeating this activity inside with household items too! Also, be sure to check out the free 5 week summer program for 2-8 year-olds that starts June 24, 2013. Love how you’ve connected the book to nature and math. Thanks so much for linking to the Outdoor Play Party. I love how you added a literacy connection to the measuring!